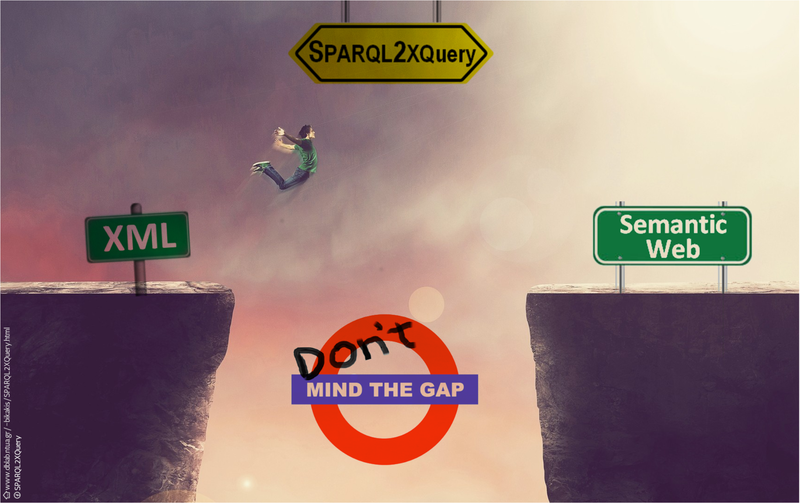 The SPARQL2XQuery Framework | Bridging the Gap between the XML and the Semantic Web Worlds. Framework, XML datasets can be turned into SPARQL endpoints. [09|2016] New version (v.1.3) of W3C Standards Timeline released! #New Version #Timeline #W3C. [11|2014] New version (v.1.2) of W3C Standards Timeline released! #New Version #Timeline #W3C. 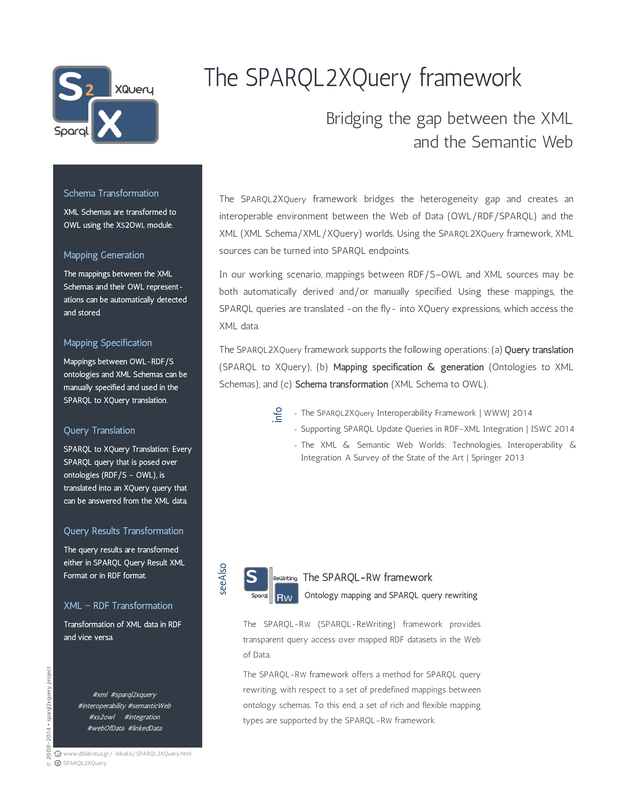 [08|2014] A SPARQL2XQuery poster has been accepted for presentation in the International Semantic Web Conference! #ISWC14 #poster. [09|2013] A SPARQL2XQuery article has been accepted for publication in World Wide Web Journal! 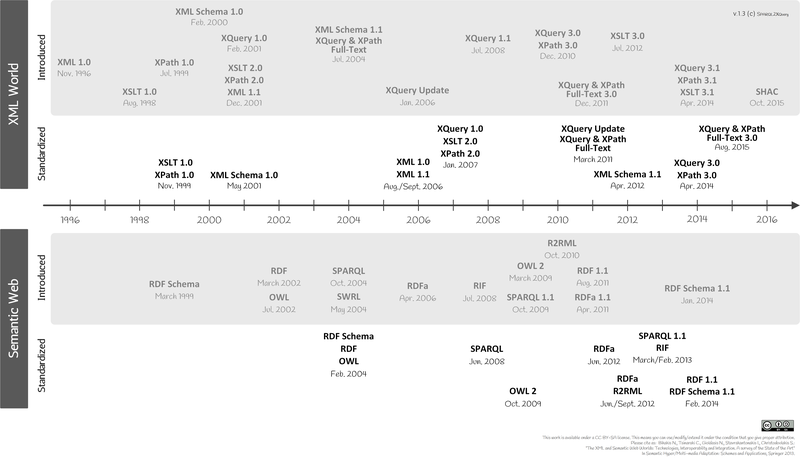 [07|2013] New version (v.1.1) of W3C Standards Timeline released! #New Version #Timeline #W3C. [07|2013] Like SPARQL2XQuery on Facebook! #Facebook. [07|2013] Like SPARQL-RW on Facebook! #SPARQL-RW #Facebook. Mapping Generation. The mappings between the XML Schemas and their OWL representations can be automatically detected and stored. Stavrakantonakis I., Tsinaraki C., Bikakis N., Christodoulakis S.: "SPARQL2XQuery 2.0: Supporting Semantic-based Queries over XML Data". 5th International Workshop on Semantic Media Adaptation and Personalization (SMAP '10). Bikakis N., Gioldasis N., Tsinaraki C., Christodoulakis S.: "Querying XML Data with SPARQL". 20th International Conference on Database and Expert Systems Applications (DEXA'09). Bikakis N., Gioldasis N., Tsinaraki C., Christodoulakis S.: "Semantic Based Access over XML Data". 2nd World Summit on Knowledge Society 2009 (WSKS '09). SPARQL-RW. Ontology Mapping and SPARQL Query Rewriting. XS2OWL. Transform XML Schema into OWL otnologies. © 2008-2014 · sparql2xquery project.